One of the major hazards of forming a company is knowing that someday, the name you chose for your product might also be used as the hashtag for a global movement that documents the prevalence of sexual abuse. MeToo! 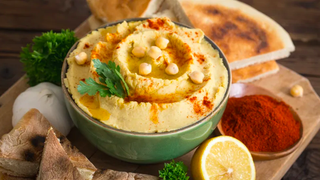 hummus is probably really good—it’s vegan, gluten-free and locally made. Unfortunately, the 14-year-old British company has seen declining sales since the birth of the other MeToo, the one created by Tarana Burke that became a household phrase in 2017 following the accusations leveled against Harvey Weinstein. “We haven’t got a definitive answer on this, but we are 90% sure that our name is not something anyone wants to put on the shelf,” founder Ramona Hazan told The Guardian. Her predicament is indeed unique, since the movement obviously isn’t a money-making venture to which the usual copyright laws would apply. “It’s not as though we’re Coca-Cola and could turn around and go: ‘Guys, stop using my name,’” she said. Had Hazan been a slightly different type of entrepreneur, she probably would have capitalized on the opportunity to align her MeToo! with the other #MeToo. After all, her business is women-run and owned. But though she did think about it, she ultimately decided that “we didn’t want to benefit our business on the back of other people’s suffering.” Imagine, a brand that doesn’t seize this zeitgeist as a way to sell things.